”Honest Abe” has to rank as one of the all-time great nicknames in American politics, but when you think about it, there’s a lot of pressure that goes along with that name. When you’re dressed as Honest Abe, people are going to hold you to it: no fibs, no exaggerations, certainly no outright lies. 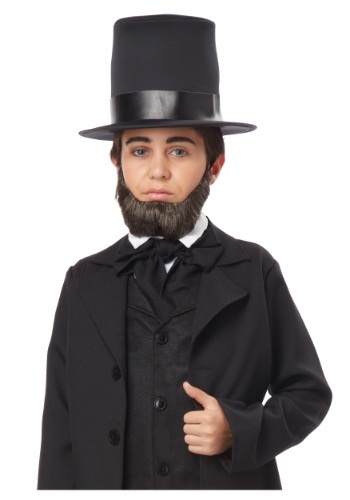 When people see a chin-strap beard and a stovepipe hat coming up the street, they think, “Well, here’s somebody who’s gonna tell it to me straight.” It’s your duty as an Abe Lincoln costume owner to live up to that standard. Of course, if you’re the type who’s thinking of dressing up as our 16th president, we bet you’re not the type to go around spreading misinformation anyway. Honesty is the best policy, after all, and any true Abe admirer knows that by heart. Start your young one off on an honest path with this synthetic, brown beard with a smattering of gray (running a country during the Civil War is a stressful job, after all). The beard secures with an elastic band and adhesive tabs for extra support. It’s an instantly recognizable look that should leave everyone at the costume party honestly impressed.